Expired 2y ago . Last validated 2y ago . Used 3 times. Luis Romero Type the Promotion Code into the Promotion code box in your shopping bag. Ashley Drewes Cyber Week Sale! 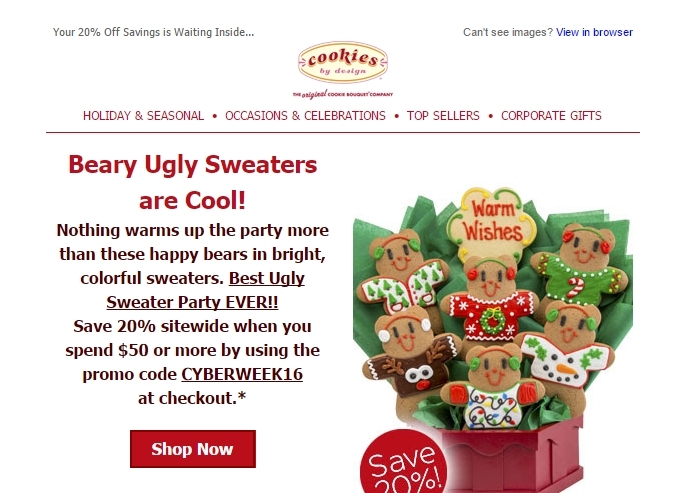 Take 20% off all all orders over $50 at CookiesByDesign.com! 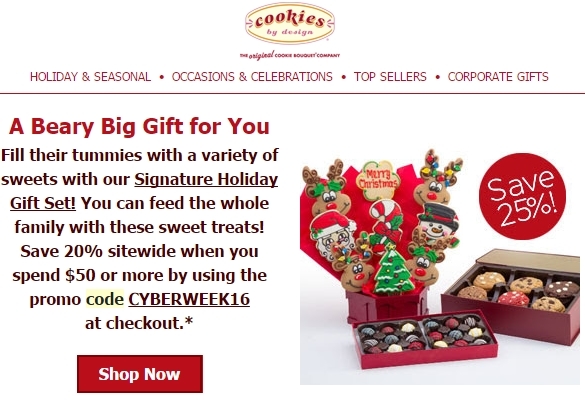 Use promo code CYBERWEEK16 to take advantage of this great deal! This offer is limited and expires 12/4/16. Plus, same day delivery is available on a variety of their products to select areas of the country. Mark Factoran Save 20% sitewide when you spend $50 or more by using the promo code CYBERWEEK16 at checkout. Promo for any order of $50 or more. Excludes gluten free, tax, and delivery. Some restrictions apply. Expires Today 12/4/16. Please visit our website, one of our many local shoppe locations, or call 855.COOKIES to place an order. Cookies by Design reserves the right to promote Cupcake By Design. 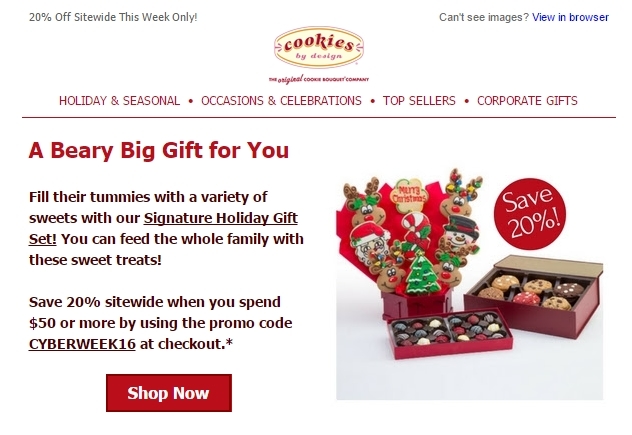 Cookies By Design's CookiEmail is sent to anyone who provides their email address by requesting a catalog, franchise information, or placing an order through our website http://www.cookiesbydesign.com or from one of our locations.